For many people, a car isn’t just a tool to get you from point A to B. It’s also a way of life and can mean the difference between having your dream job and unemployment. We rely on our cars to get us from home to work or even school. If you want a car to last, then you really need to take care of it. The Vehicle Care Log is a great tool to help you track the services your car has had and those that it desperately needs. Depending on the manufacturer, you will need to get oil changes and regular checkups every few thousand miles. This template gives you a convenient way to catalog all this information so you can easily give your car the attention it needs. Downloading this template is as simple as clicking the link below. On the left-hand side of the page, you’ll find a list of common repairs that cars undergo over time. You can change or add new items simply by clicking on the cell and adding something new. At the top of the screen is where you will list the dates and any notes you may have about your car. Whenever you take your car in for a repair, you will enter that date in the top row and write the price of repair in the corresponding cell. 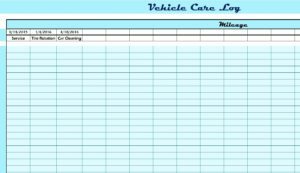 The Vehicle Care Log will take the figures you enter into the document and give you a total in the final column. This makes it easier to figure out problems with your car and helps your mechanic with accurate information to properly diagnose the issue.